E7 Now & Then: Uncle Joe knew where you lived! Uncle Joe knew where you lived! A timely post, as the media is awash with stories of Russian spies. 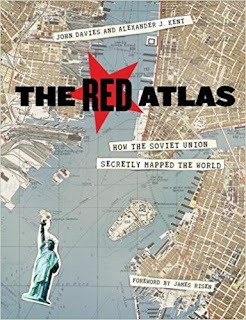 Newham Bookshop and the Wanstead Tap recently hosted a great evening of author John Davies talking about his recently published book, The Red Atlas (see footnote for details). We were delighted when he agreed to write an article about it - and its references to Forest Gate, in particular for this website. In the article below, John tells the story of the book, in relation to East London. 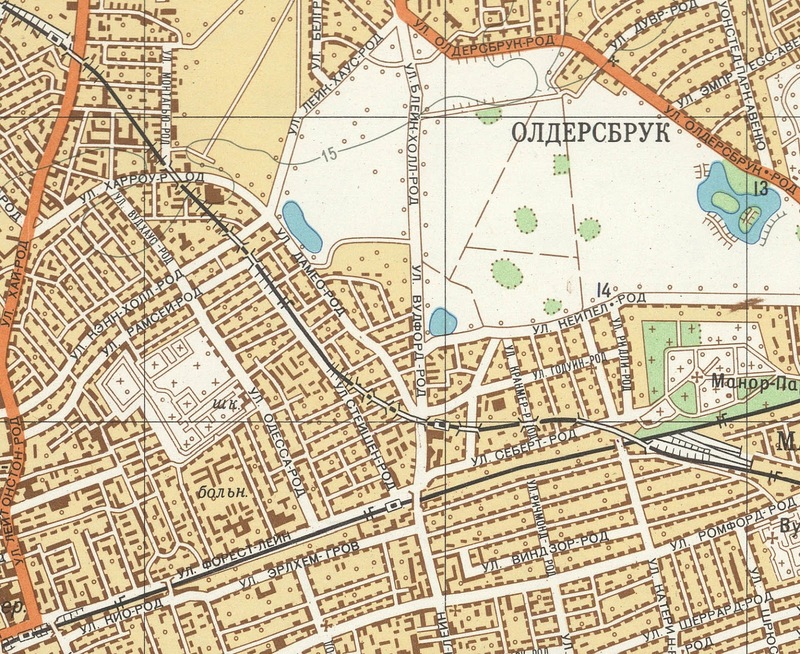 At the foot of the article, there is a small section specifically commenting on Forest Gate, through the eyes of the cartographers. In all cases, it should be possible to increase the size of the map on your screen, by clicking on it - to follow the captions. Do you live in ОЛДЕРСБРУК, ФОРЕСТ-ГЕЙТ, МАНОР-ПАРК, УОНСТЕД or ЛЕИТОНСТОН? If so, then during the Cold War, Uncle Joe (that’s Churchill’s ironic nickname for the Russian dictator Stalin) – and all his successors through to Gorbachev, certainly knew all about your district, your road, even your house. For Aldersbrook, Forest Gate, Manor Park, Wanstead and Leytonstone (as we know them) were among the places featured in incredible detail in a series of maps created and maintained by the Red Army throughout the period from the end of the Second World War until the collapse of the Soviet Union in 1992.
unlike the stations on the other lines. The four-sheet map of Greater London, for example, from which these extracts are taken, was compiled in 1980 and printed in 1985. It is at the scale of 1:25,000 (about 2½ inches to the mile, the same as the familiar Ordnance Survey Explorer maps), with a supplementary booklet listing nearly 400 ‘Important Objects’, a street index, a descriptive essay detailing the topography, climate, demographics, industry and economy of London, and a diagrammatic map of the Underground network. 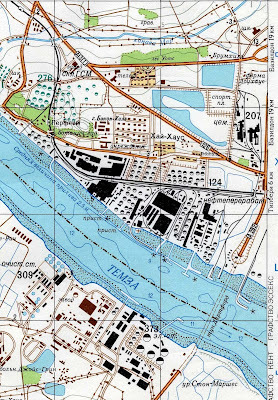 Sheet 2, north-east London, is a large sheet of paper, measuring about 1 metre by 1.1 metres, printed in ten colours, covering an area from Blackfriars Bridge in the south-west corner, north up the Lea Valley to Enfield and east as far as Aveley and Upminster. The other three London sheets extend as far as Watford in the north-west, Weybridge in the south-west and beyond Orpington in the south-east. 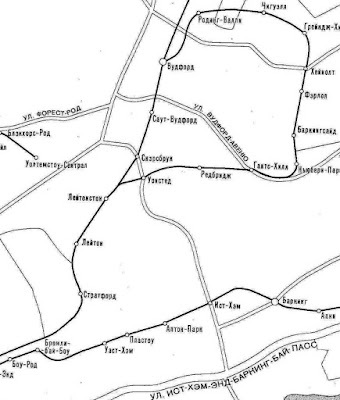 Depicted on these maps is information not shown on British Ordnance Survey or commercial street atlases of the time, such as annotation indicating the width and surface material of highways, the European road number of major routes, the load-bearing capacity of bridges, the names and products of factories, the distinction between ‘metro’ lines and stations (ie the Underground) and national railway lines and stations, the distinction between electrified and non-electrified lines – and even in some cases showing on which side of the tracks the station building is located. The maps use colour-coding to identify ‘Important Objects’ which are numbered and listed in the accompanying index. Objects of military significance are coloured green, governmental and administrative objects in purple and industrial, utilities or transportation in black. The information is exceedingly well researched and few errors are found. One such error, presumably ‘lost in translation’ is object 263, coded purple, which is listed as ‘the residence of the queen and prime minister’ but is in fact Her Majesty’s Theatre, Haymarket in the West End. London Council, 351 HQ General Staff. London was not the only British city mapped in this way; at least 100 other such maps are known, most of which are the larger scale of 1:10,000 (about six inches to the mile) and include such places of relative unimportance strategically as Gainsborough, Lincolnshire and Dunfermline, Fife. The earliest known are 1950 maps of Milford Haven and Pembroke Dock, the latest is a map of Falmouth dated 1997 (after the demise of USSR). Some of the maps overlap, particularly in the industrial areas of Lancashire and West Yorkshire. 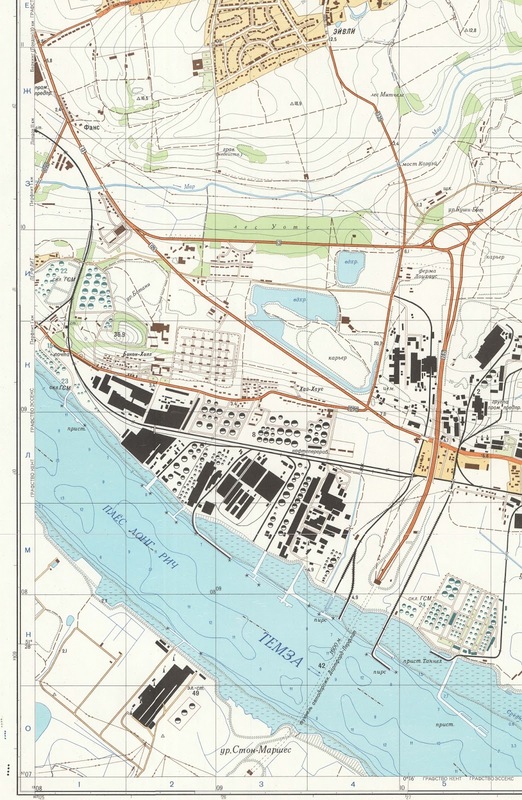 In fact, Aveley and the Dartford Tunnel appear on the overlap of the London map and the 1:10,000 Thurrock map of 1977. 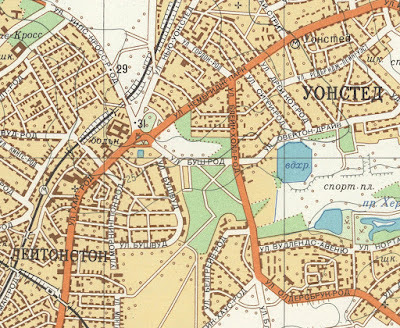 Other local maps include Southend-on-Sea (1985), Colchester (1975) and Luton, which was mapped in 1973 and again in 1986.
convention which is not used on British maps. The maps are labelled Secret and were produced by VTU (the Military Topographic Directorate of the General Staff of the Soviet Army - Военно-Топографическое управление Генерального Штаба Советской Армии). 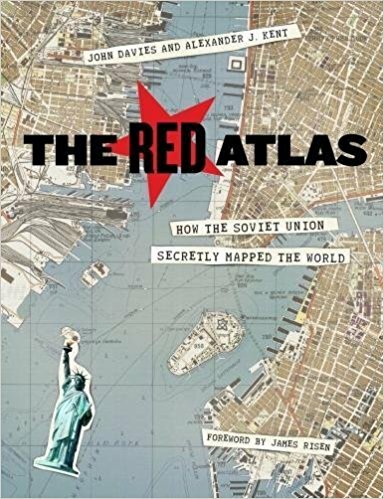 Their existence was unknown to Western military and only came to light in the shambolic circumstances after the collapse of USSR, thanks to exploits worthy of a John Le Carré spy novel; in some cases stocks of maps were sold as ‘waste paper’ to save the cost of destroying them; in other cases semi-official sources desperate for dollars clinched black market deals with eager American dealers. 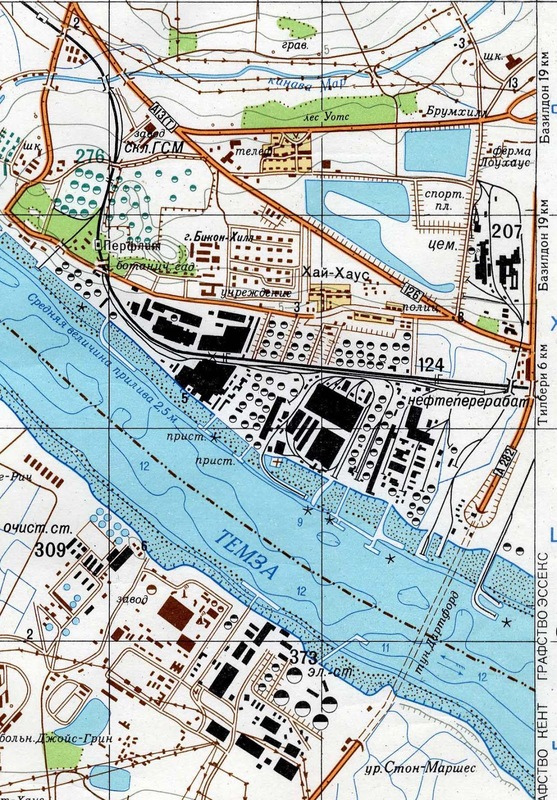 This was in the early 1990s, the era before the ready availability of the kind of geo-information freely available today, such as online maps, street views and satellite images. 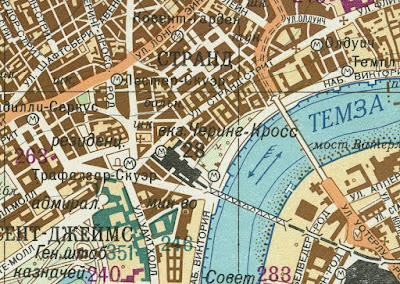 Commercial map makers in Britain wanting to produce and sell maps would have only three choices in deriving the necessary source information: do their own survey (time-consuming), use out-of-copyright Ordnance Survey maps (at least fifty years out-of-date), or pay licence fees to OS (expensive). 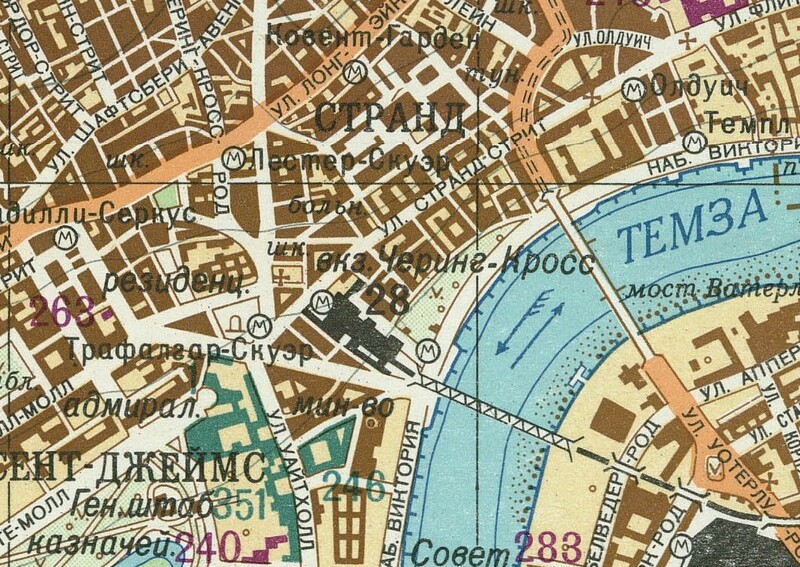 The sudden influx of cheap, accurate, modern mapping looked like it would change all that. At the time OS was engaged in a long-running dispute with the AA over alleged copyright infringement (which it eventually won with a £20 million out-of-court settlement in March 2001) and was determined to avoid this potential undermining of its business model. 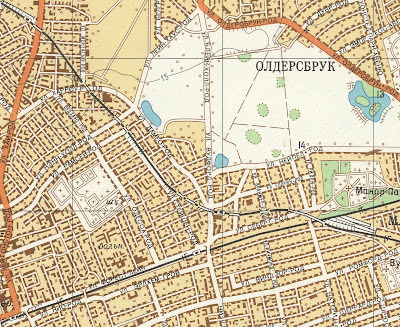 Thus, the OS declared that the Soviet mapping ‘is almost entirely an adaptation of Ordnance Survey Crown copyright material. It was produced without the permission of Ordnance Survey and thus it infringes Ordnance Survey's Crown copyright’ and went on to demand that anyone in possession of the maps hand them in and to threaten legal action against anyone importing or offering for sale or reproducing any part of the maps. This statement, although not quite the truth, was sufficient to suppress any interest in the Soviet maps in UK until recently. 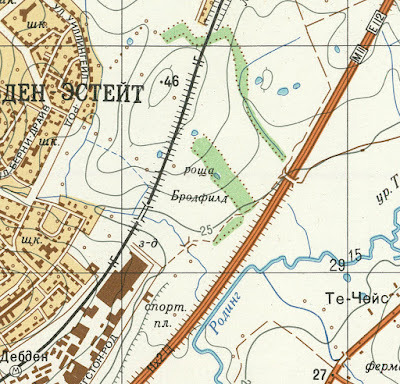 In fact, although information derived from OS maps can be seen to contribute to the Soviet maps, OS is only one of many sources that were used. Others included satellite images, trade directories, railway timetables, tourist guides, street atlases, and observations by agents on the ground. 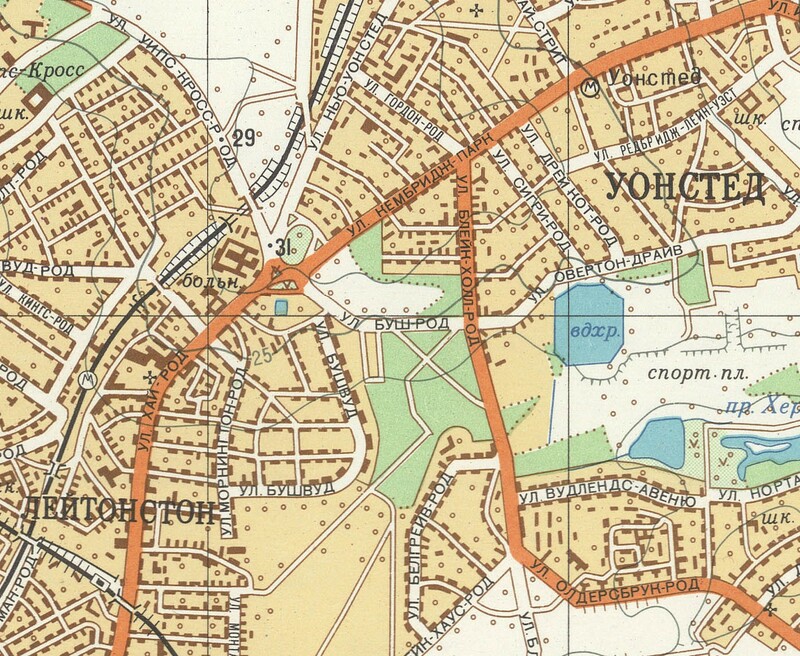 Above is the Forest Gate detail of the Soviet map surveyed in 1980 and printed in 1985. By clicking on it, it should be possible to enlarge it for a closer view. If so, and you live in Forest Gate, you will probably be able to see your house marked - so, Uncle Joe really could have known where you lived! There are a few points of particular interest. This section of the map is clearly dominated by Wansted Flats; but the area is marked Aldersbrook. This is confusing to the casual viewer, but apparently quite common for map makers to do - they often label blank spaces according to the nearest housing development. It is interesting, though without explanation, that the two sections of the Flats adjacent to Centre Road (see below) are predominantly shaded white, whereas the sections near Dames Road and north of Cann Hall Road are predominantly pale brown. There are no obvious explanations for this. The lakes/ponds, tree clusters and banking by Alexandra Lake are all well and accurately marked. The two other largish areas without a light brown background are the cemeteries - Manor Park with a mixture of white and green (for grass) backgrounds, the West Ham and Jewish cemeteries with simply a white background - indicating no large grass areas. Just south of the West Ham/Jewish cemeteries is a cluster of buildings, with a name. The word is "hospital", from the days (accurate when the map was plotted) that what is now Gladys Dimson House, was then Newham Maternity Hospital. The road markings are strange. Romford Road (the A118) is quite clearly the most important, strategic and busy road covered by this section of the map, but it is given a lower status - by colour - than both Leytonstone and Aldersbrook Roads. We have no logical explanation for this. 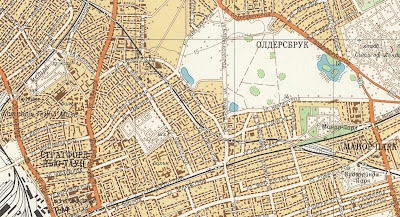 Other roads, clearly marked, in the Cyrillic script are: Earlham Grove, Forest Lane, Odessa Road, Ramsey Road, Cann Hall Road, Dames Road, Capel Road, Cranmer Road, Sebert Road, Godwin Road, Ridley Road, Windsor Road, Katherine Road and Sherrard Road. Centre Road is wrongly marked as Blake Hall Road, with the map maker, wrongly assuming that Centre Road was simply a continuation of Blake Hall. 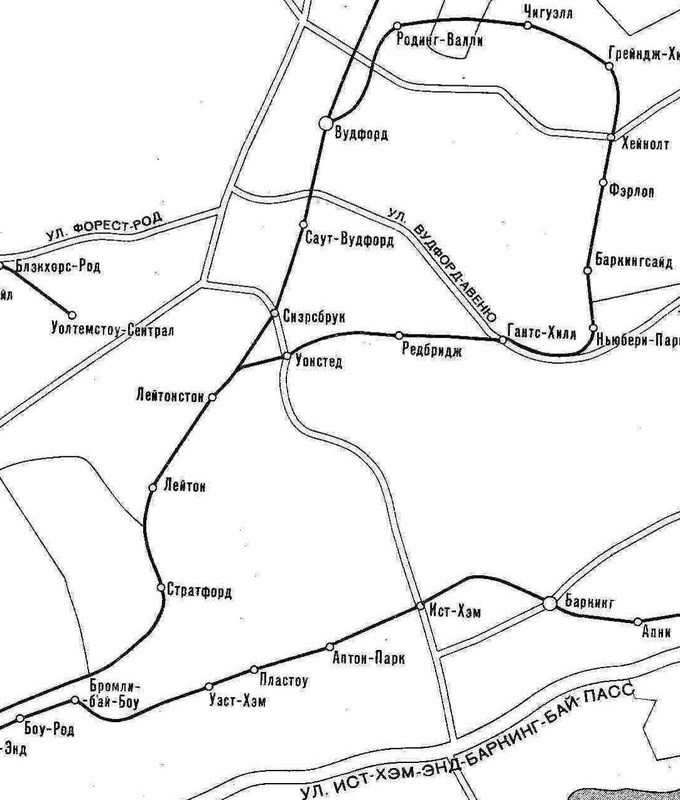 What, at first sight, appear to be the railway arches along the Goblin line, are not the arches, but railway embankments. Towards the top right hand of the map is a wiggly line. This is the 15 metre contour line. There is a 13 metre spot height indicated on Aldersbrook Road and a 14 metre mark on Capel Road.